Rosy Boas are a larger heavy bodied boa constrictor, which is the family of snakes that constrict their prey to kill it rather than eat it live. Rosy boas are among the smallest snakes in the boa family, usually not growing longer than three feet in length. The female Rosy Boa is larger than the male, with a small head, that is hard to distinguish from the body, and have smooth, shiny scales. The rosy boa usually has a pattern of three stripes down the length of their body (one stripe on the dorsal side and the other two running laterally). The background is usually lighter. 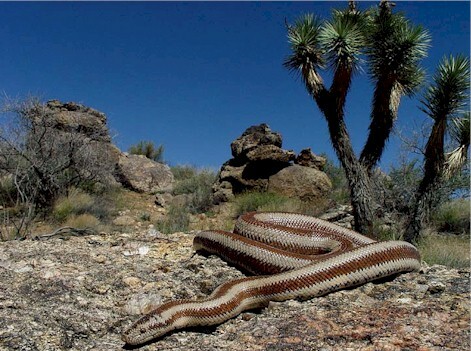 The Rosy boa can be seen in the Mohave Desert, and the Colorado Desert in Southern California, and south to the Baja Peninsula, east to the basin ranges of W. Arizona, and western Sonora in Mexico. You would find them living in desert environments, arid sage scrub, rocky areas, ravines, and particularly where there is moisture. Like other boas they kill their prey by constriction. They are primarily a ground dwelling snake, but will and are able to climb. Rosy Boas are not completely nocturnal but are mostly active at night and also at dusk. In the early spring or in the cooler areas of its range, they may be active in the daytime. If feeling defensive, they may roll up into a ball keeping their head in the center for protection and release a foul smelling musk. The Rosy boa will come out of hibernation in March or April and begin to breed in May or June, when they will give birth to about 10-15 young snakes after a gestation of about 120 days.. 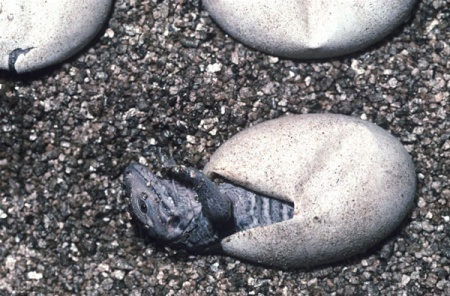 Unlike most reptiles, boas have live births rather than eggs. When they are born, the young boas may not eat for about three months, being born just before time for hibernation, so they will wait to eat until they come back from hibernation season. The Male Rosy Boas have two claw spurs that they use to interest the female in mating. Rosy Boas have been recorded to have lived well over 18 years in the wild, preying on small mammals and birds. The rosy boa has been recorded living over 18 years. They are currently a federal special concern species and being protected from trade. To collect them in the wild in California and Arizona requires a permit and hunting license. Commercial collecting is not allowed, however they are not currently endangered. How in the world do yo catch one of these snakes, It’s so hard!